\u201cMemory, of course, is sometimes like a bucking horse, sometimes a runaway one, and one must control the reins until finally it stops, snorting with exhausted relief,\u201d writes Natalie L. M. Petesch in her haunting new collection, The Confessions of Se\u00f1ora Francesca Navarro and Other Stories. Petesch immerses readers in the lives of people caught up in the 1936-39 Spanish Civil War, which left more than five hundred thousand dead. She captures the hand-to-mouth existence on the streets of Madrid of two war orphans; an old soldier's memories of a fallen militiawoman; the dilemma of Franco's laundress as she seeks to duplicate a stolen religious icon she finds in his home; and a man's struggle to find his bride among thousands of Republican refugees waiting for ships to evacuate them before Franco's Fascists arrive to kill them. In the title novella, an elderly woman describes to her granddaughter how the families of Franco's officers fighting against Republican militiamen endured hunger, filth, and danger in an underground fortress. Petesch conveys the humiliating details of war through the sensibility of a cultured woman who recalls only too vividly latrines made of laundry tubs, the smell of unwashed humans, and the stench of death. 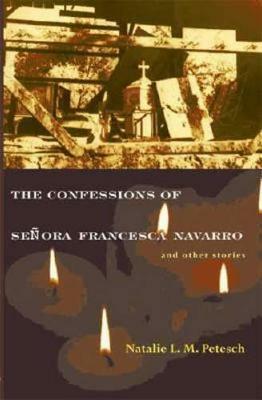 Brilliant in its imaginative power and heartbreaking in its access to the bottomless well of human tears, The Confessions of Se\u00f1ora Francesca Navarro and Other Stories is the work of a mature artist able to convey a particular world so vividly that we know these people as our own. "In The Confessions of Senora Francesca Navarro and Other Stories, Natalie Petesch has once again lent her passionate heart and passionate prose to stories and characters that live with heartbreaking honesty and dignity. These people and the events of their lives remain with me long after I put aside the pages where I met them."